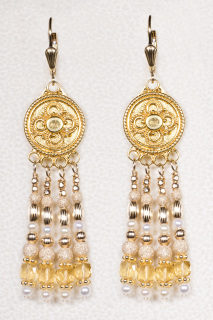 The 24kt vermeil medallions in these luxurious chandelier earrings are finely-crafted with intricate detail. 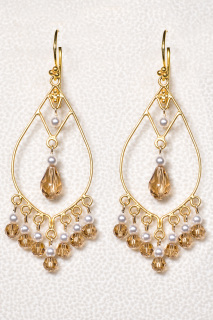 Faceted citrines in a cube shape, freshwater pearls and 14kt gold-filled beads complete the design. 2.5" in length. 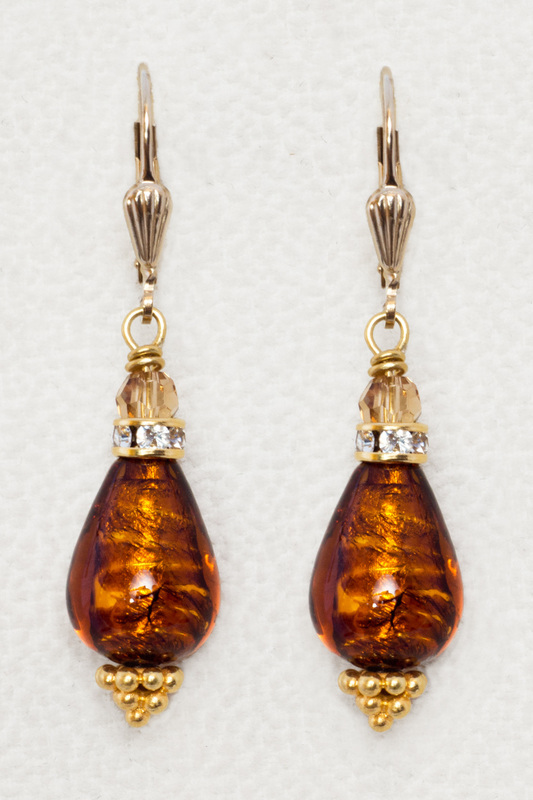 14kt gold-filled leverback earwires. 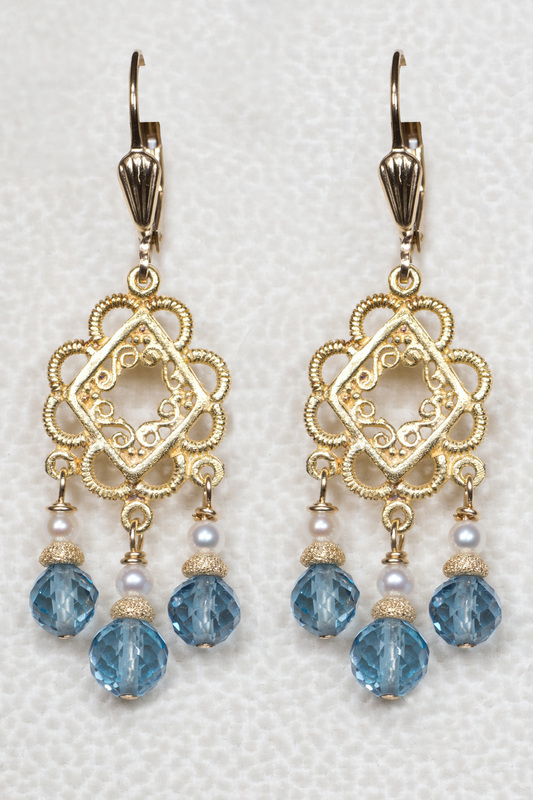 Micro-faceted London blue topaz beads dangle from delicate filigree vermeil chandeliers. 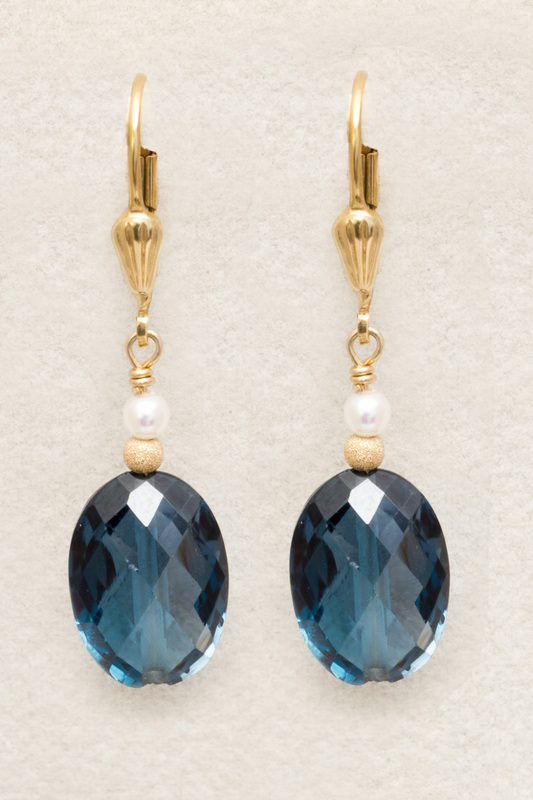 Freshwater pearls and 14kt gold-filled stardust rondels accent the topaz. 1.875" in length. 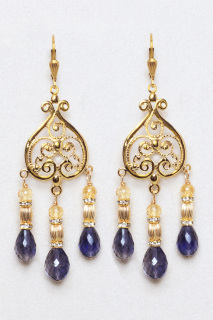 14kt gold-filled leverback earwires. 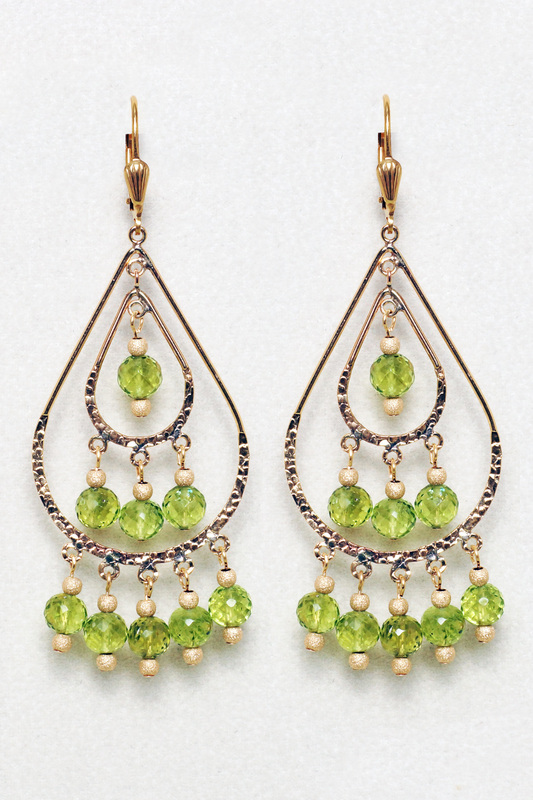 Faceted peridot gemstones, enhanced with 14kt gold-filled stardust beads, dangle from hammered 14kt gold-filled chandeliers. 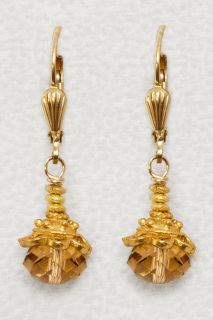 14kt gold-filled leverback earwires. 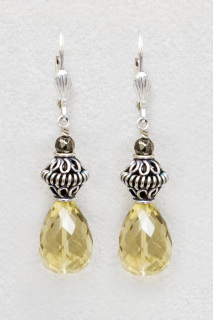 2.75" in length. 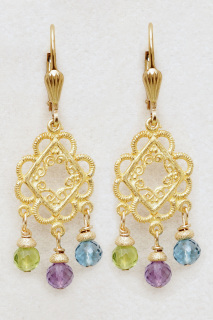 Faceted peridot, amethyst and blue topaz gemstones drop from delicate vermeil filigree chandeliers. 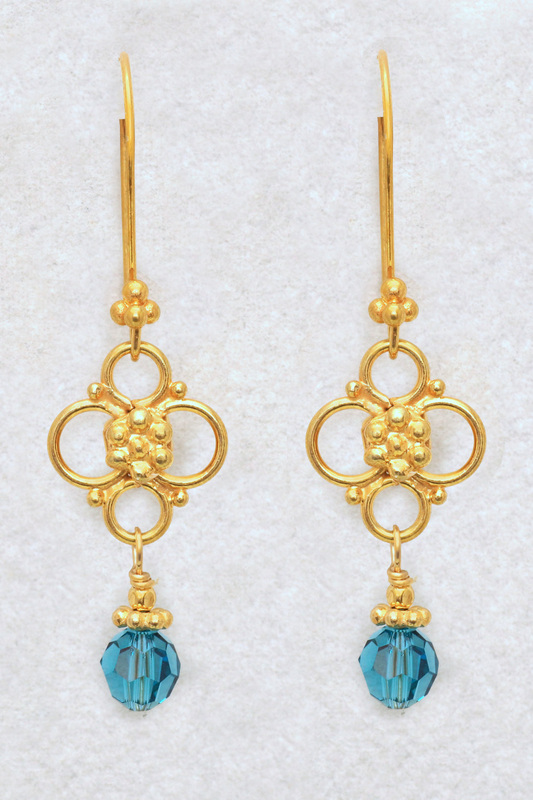 14kt gold-filled leverback earwires. 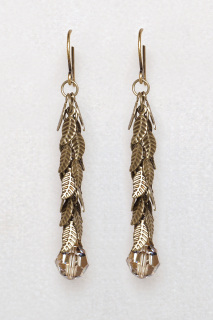 1.75" in length. These faceted ruby heart are set in a gold vermeil bezel. The l6mm rubies have been color-enhanced, which gives them an even, rich tone. 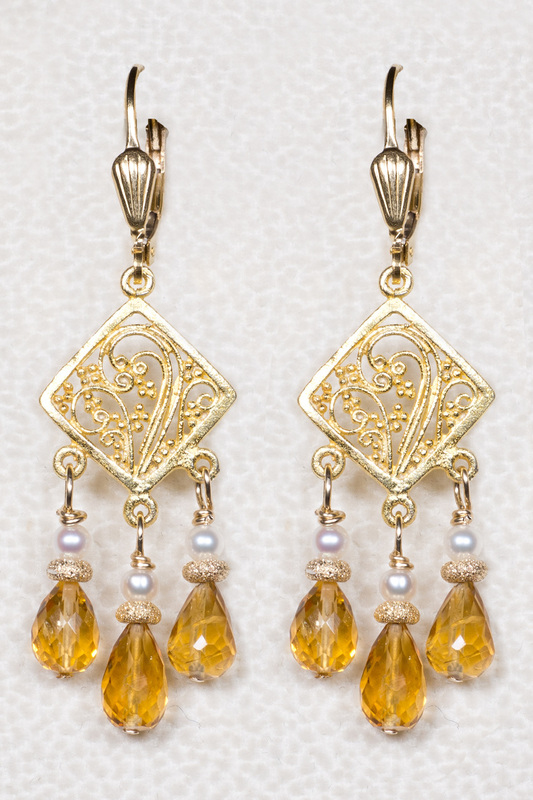 14kt gold-filled shield design leverbacks. 1.375" in length. 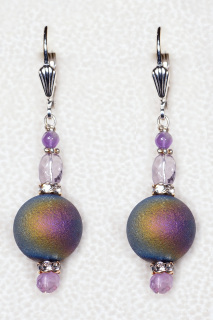 These druzy quartz beads feature a soft, iridescent matte finish. 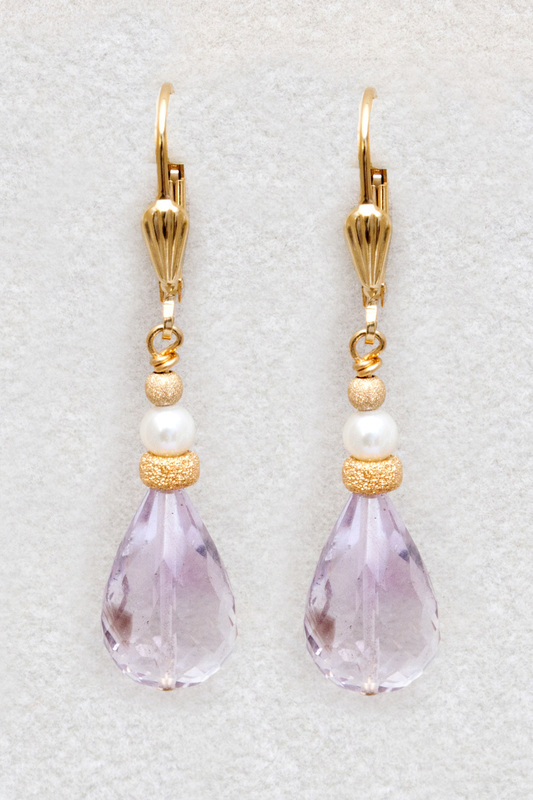 Crystal rondels and faceted amethyst add more sparkle. 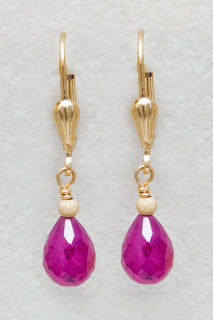 1.75" in length. 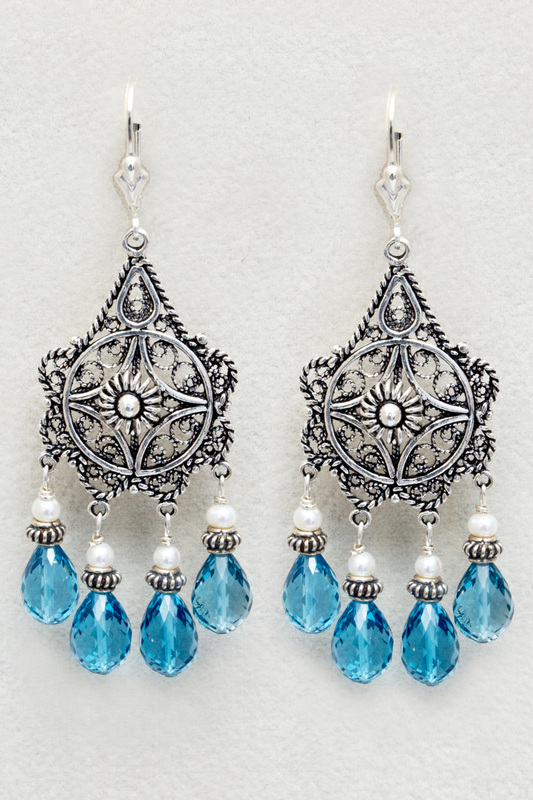 Sterling silver leverback earwires. 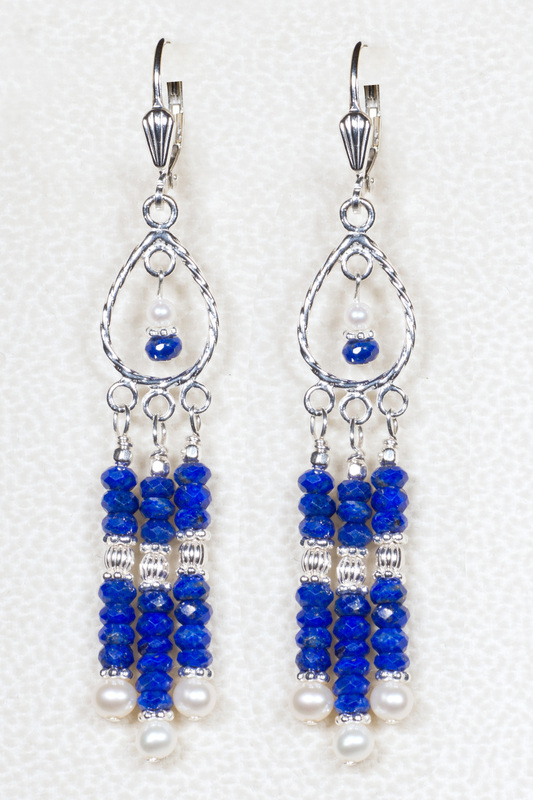 Faceted lapis rondels, freshwater pearls and sterling silver beads dangle from sterling silver chandeliers. 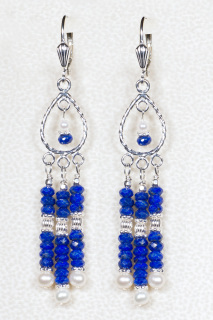 2.75" in length. 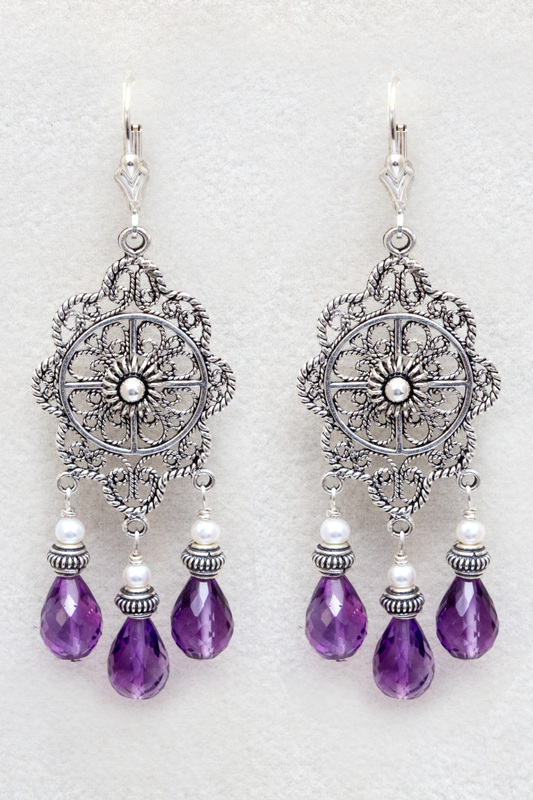 Sterling silver leverback earwires. 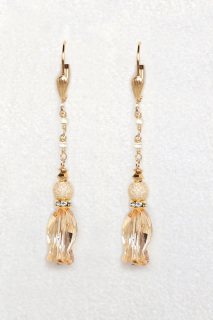 Swarovski crystal beads dangle from 24kt vermeil chandeliers for a romantic and flattering look. 2.25" in length. 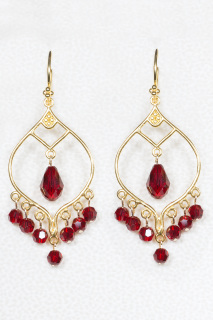 24kt vermeil French hook earwires. 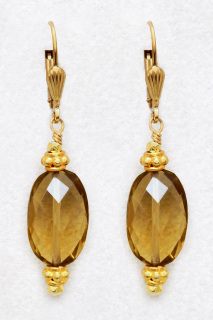 Micro faceted citrine teardrops dangle from vermeil chandeliers with a floral motif. 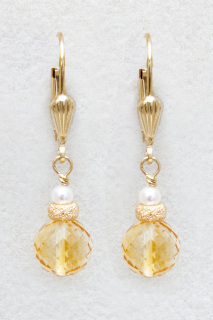 The citrine stones are a rich gold color and are accented with freshwater pearls and 14kt gold-filled stardust beads. 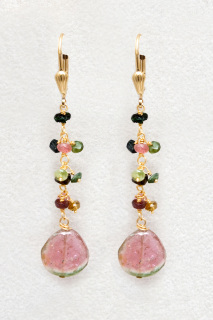 2" in length. 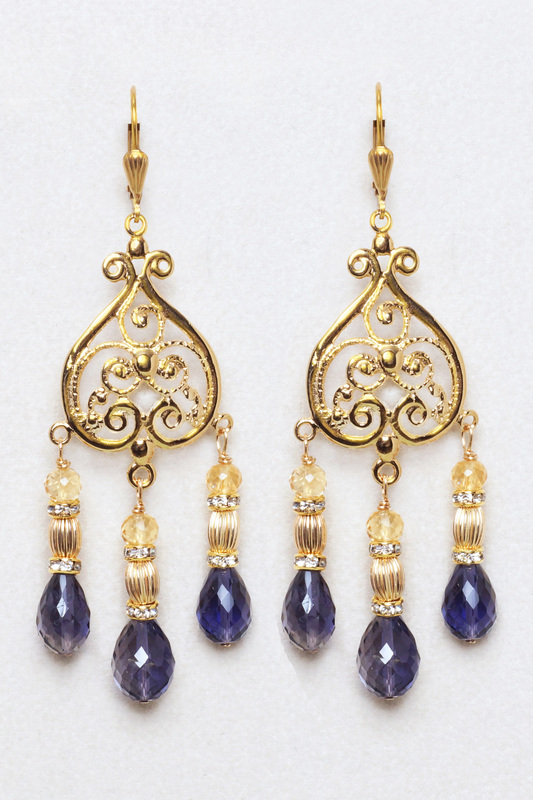 14kt gold-filled leverback earwires. 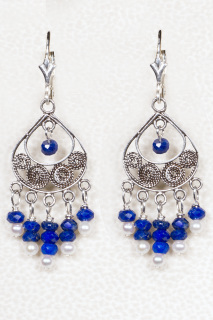 Faceted lapis and freshwater pearls dangle from antiqued sterling silver filigree chandeliers. 2" in length. 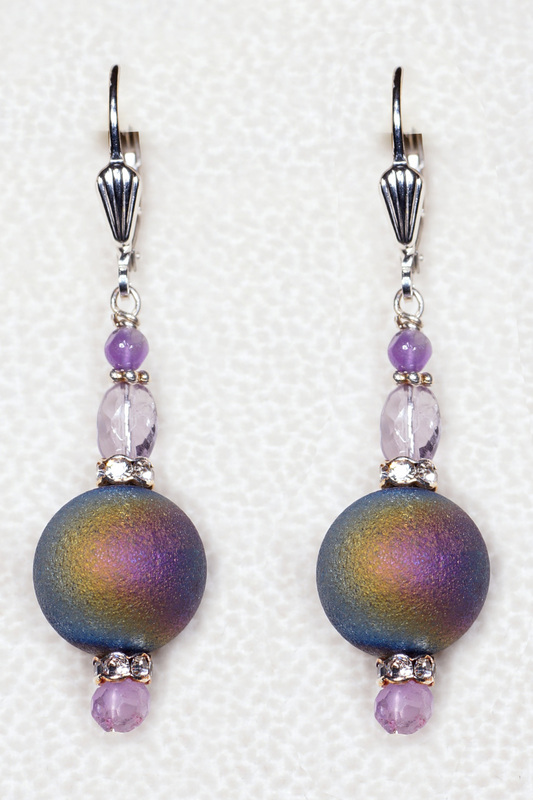 Sterling silver leverback earwires. 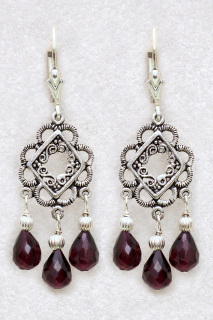 Faceted garnet teardrops dangle from oxidized sterling silver filigree chandeliers. 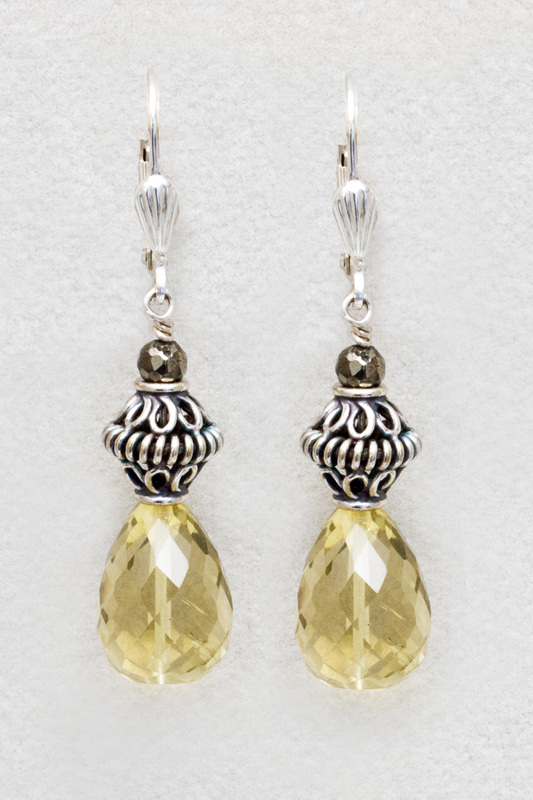 Sterling silver leverback earwires. 1.875" in length. 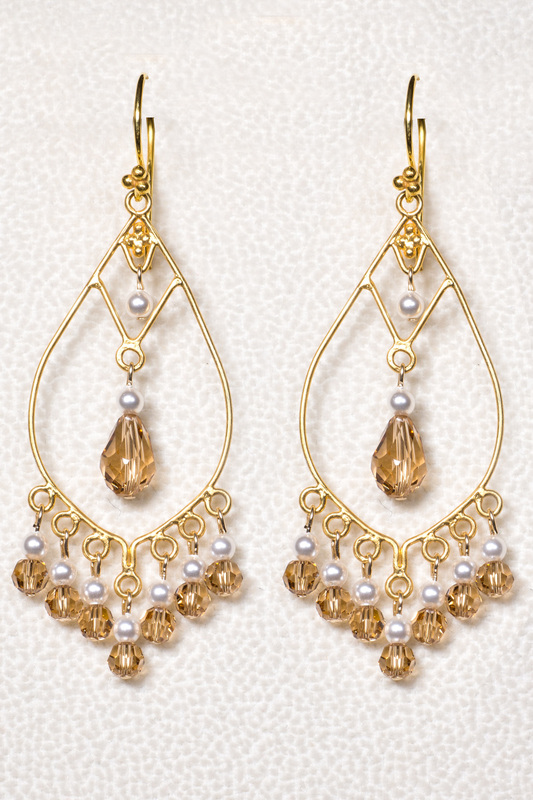 Faceted gold Swarovski crystals and pearls dangle from 24kt vermeil teardrop chandeliers for an alluring look. 2.625" in length. 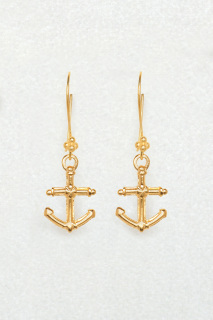 24kt vermeil French hook earwires. 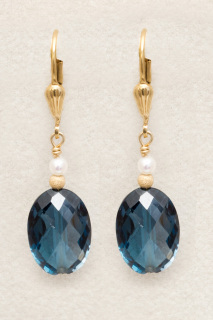 Faceted London blue topaz nuggets are accented with freshwater pearls and gold-filled stardust beads. 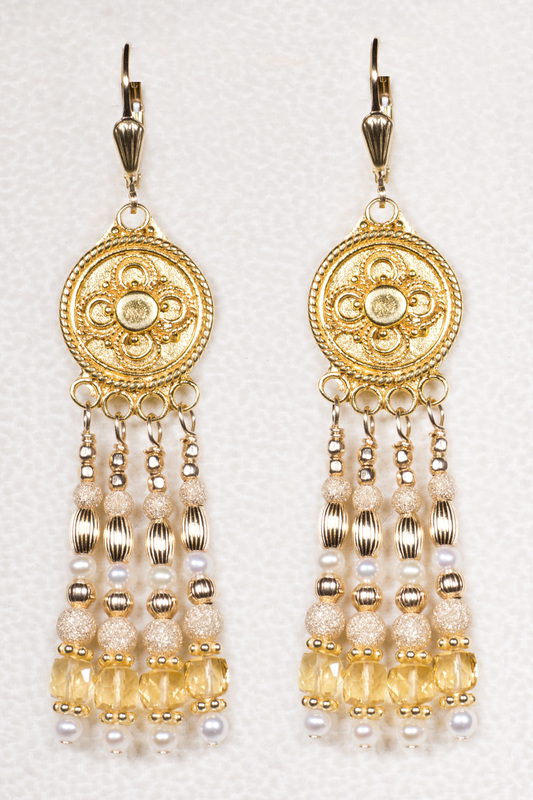 14kt gold-filled shell leverbacks. 1.5” in length. 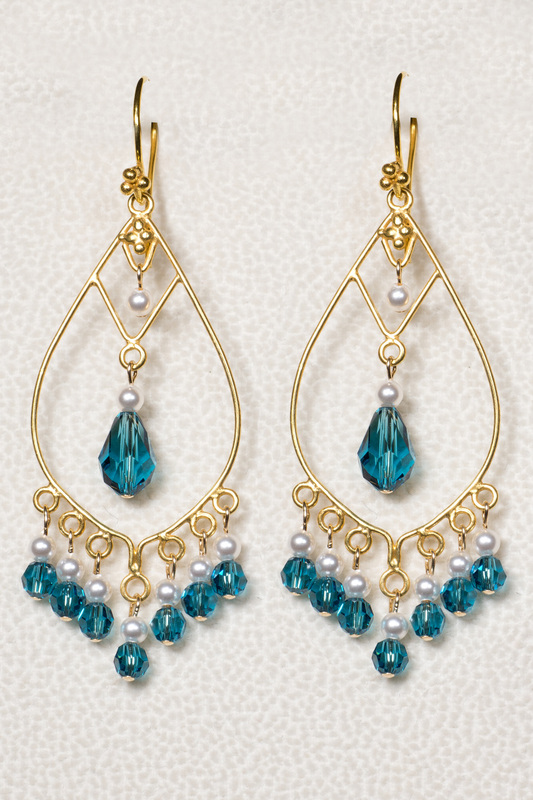 Faceted indicolite Swarovski crystals and pearls dangle from 24kt vermeil teardrop chandeliers for an alluring look. 2.625" in length. 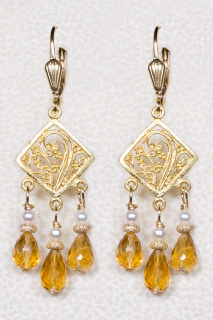 24kt vermeil French hook earwires. Faceted whiskey topaz oval gemstones are accented with 14kt vermeil Bali beads. 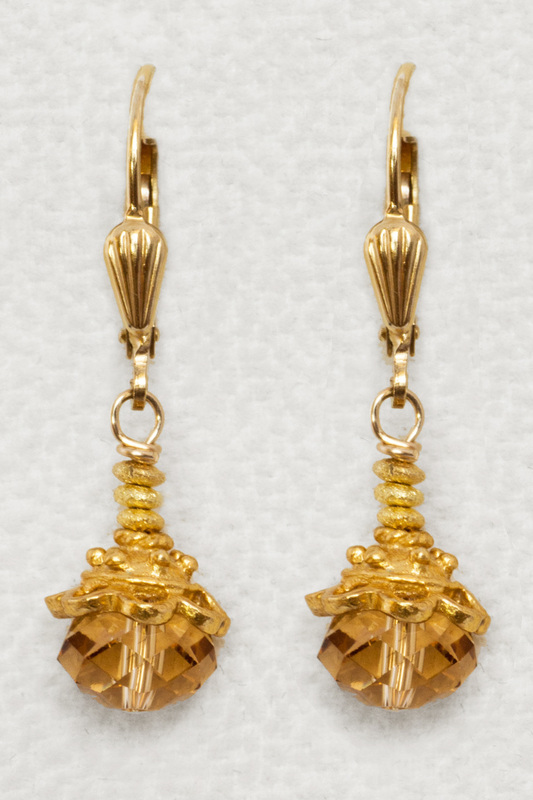 14kt gold-filled leverback earwires. 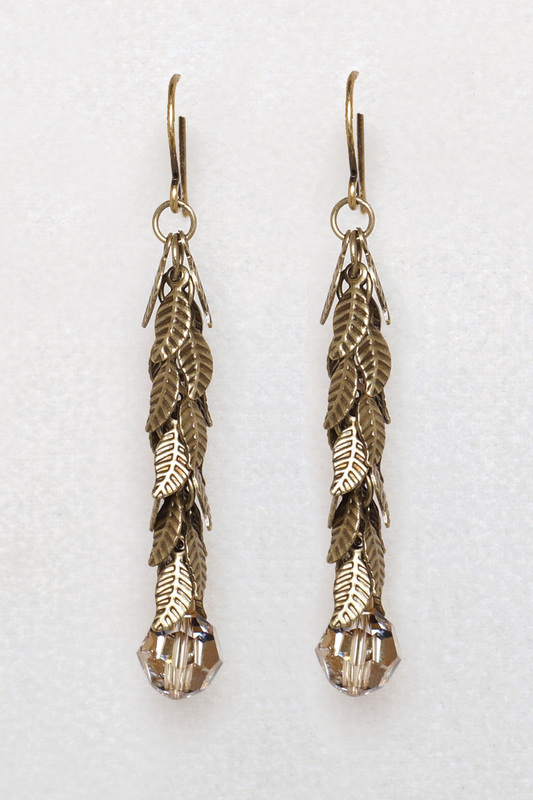 1.75" in length. Green freshwater stick pearls accented with silver rondelles, fancy crystal beads and white keishi pearls. Sterling silver leverback ear wires. 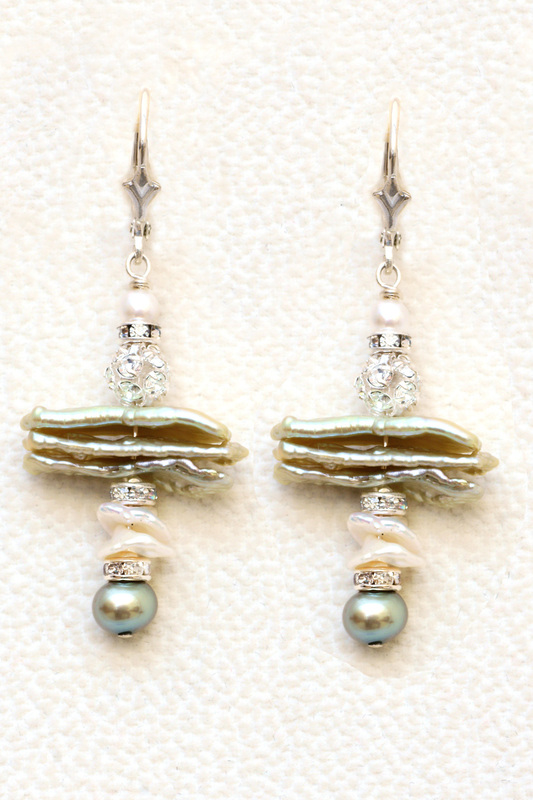 2" in length. 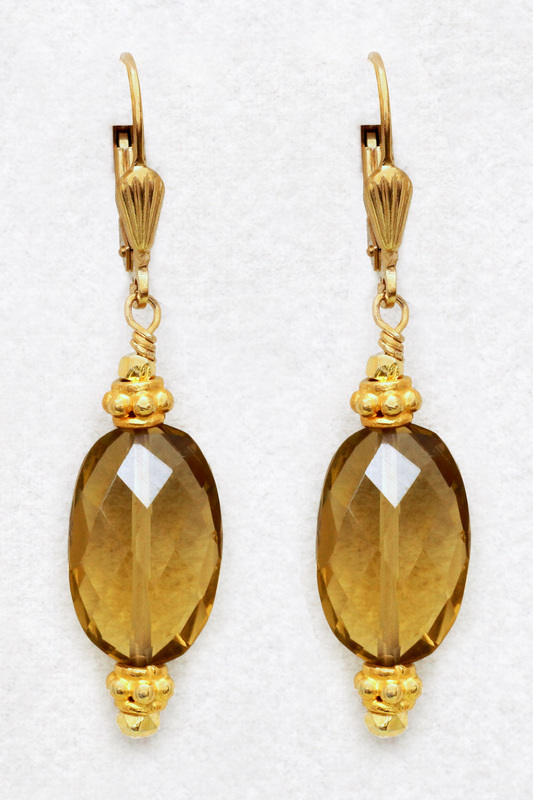 These faceted gold Swarovski crystals are enhanced with 22kt g.p. Bali beadcaps . 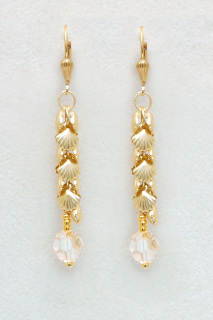 14kt gold-filled shell leverback earwires. 1.25" in length. 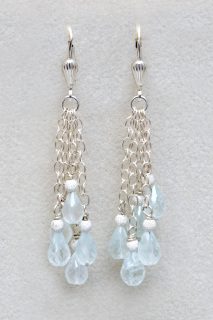 Faceted moonstones are framed with sterling silver Bali beads and freshwater pearls. 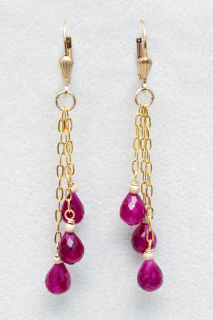 The stones dangle from a handmade pearl and sterling silver chain. 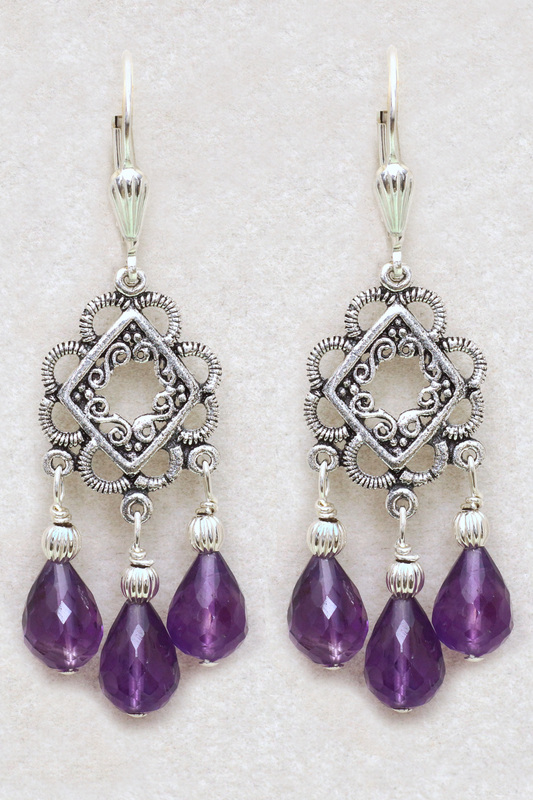 Sterling silver leverback ear wires. 2.5" in length. 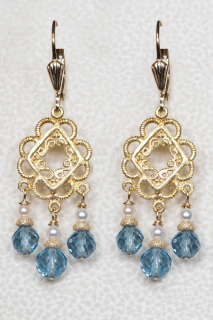 Swarovski indicolite crystal beads dangle from 24kt vermeil findings. French hook vermeil earwires. 1.75" in length. 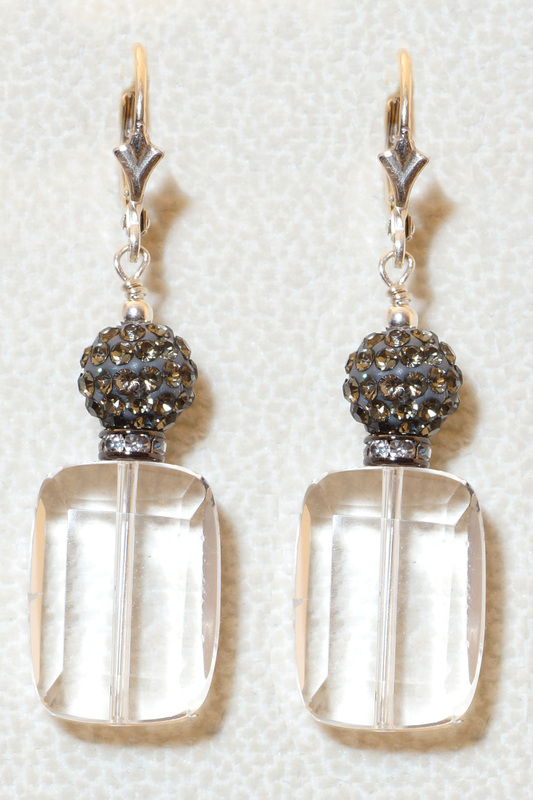 Natural rock crystal rectangles are paired with a black pave polymer bead. 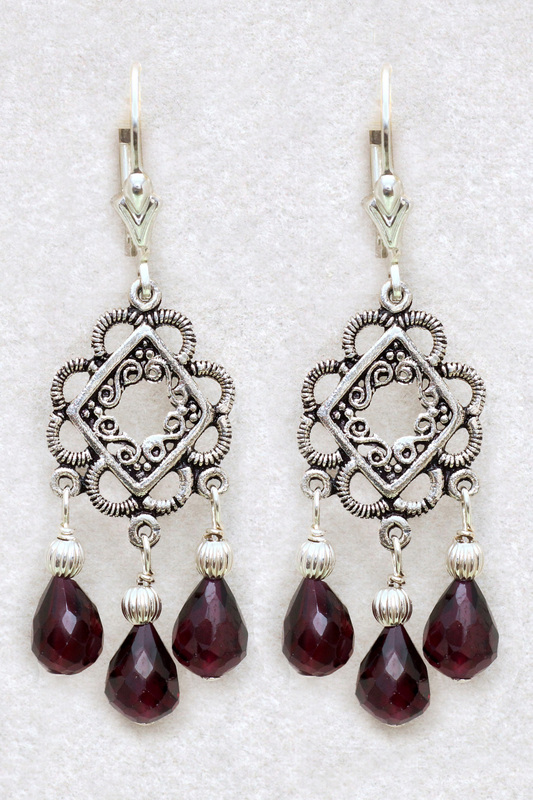 Sterling silver leverback ear wires. 2" in length. 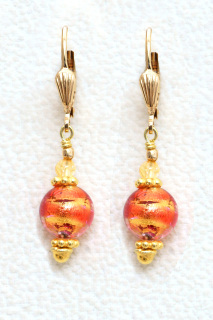 Gold lined Murano glass beads are accented with citrines and vermeil beads. 14kt g.f. leverback ear wires. 1.5" in length. 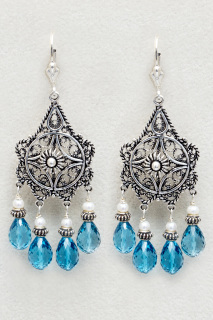 Sterling silver filigree chandeliers with faceted London blue topaz teardrops, sterling silver Bali beads and freshwater pearls. 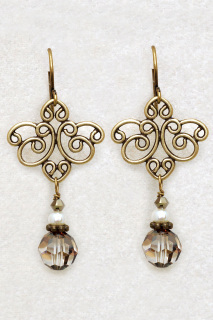 Sterling silver fleur-de-lis leverback earwires. 2.5” in length. 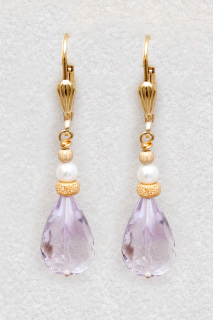 Faceted pink amethyst teardrops are accented with freshwater pearls and gold-filled stardust beads. 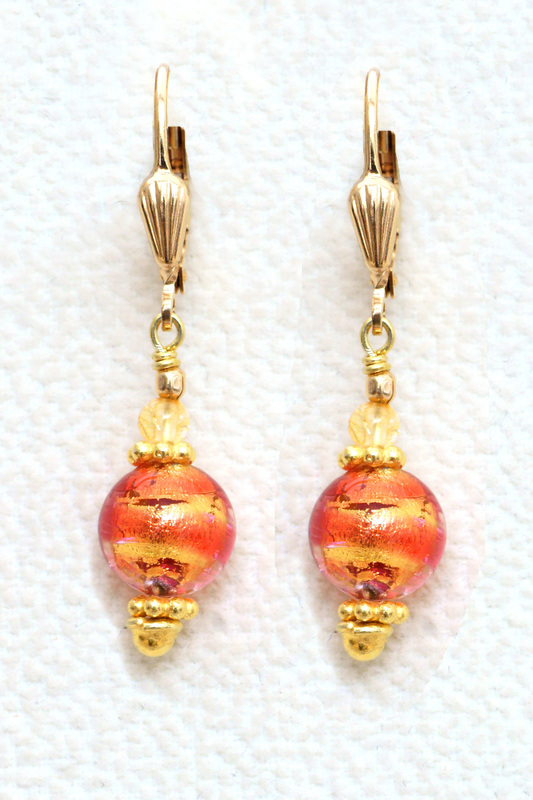 14kt gold-filled shell leverback earwires. 1.5” in length. 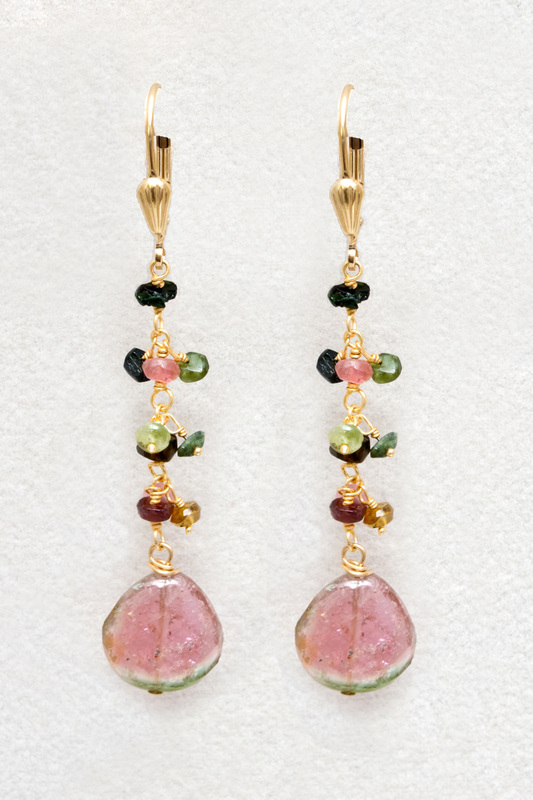 Faceted watermelon tourmaline hearts are supported by a vermeil chain containing dangling tourmalines. 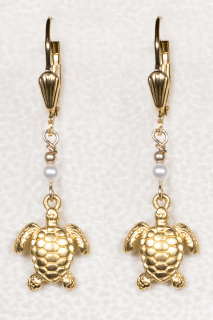 14kt gold-filled shell leverback earwires. 2.25” in length. 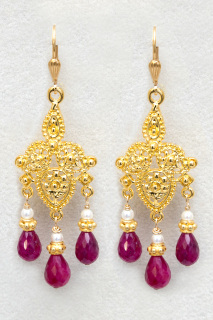 Ornate gold vermeil (gold over silver) chandeliers support three natural faceted ruby teardrops. 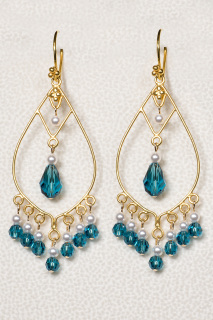 Gold vermeil Bali beads and freshwater pearls complete the design. 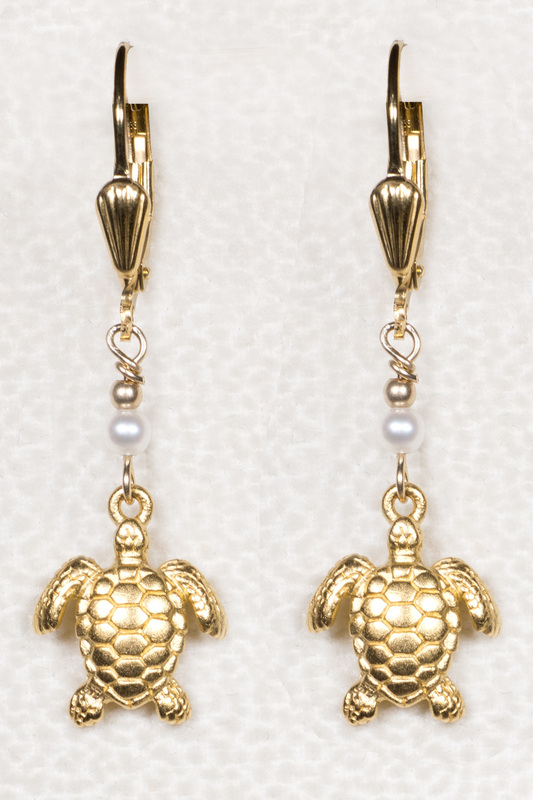 14kt gold-filled shell leverback earwires. 2.5” in length. 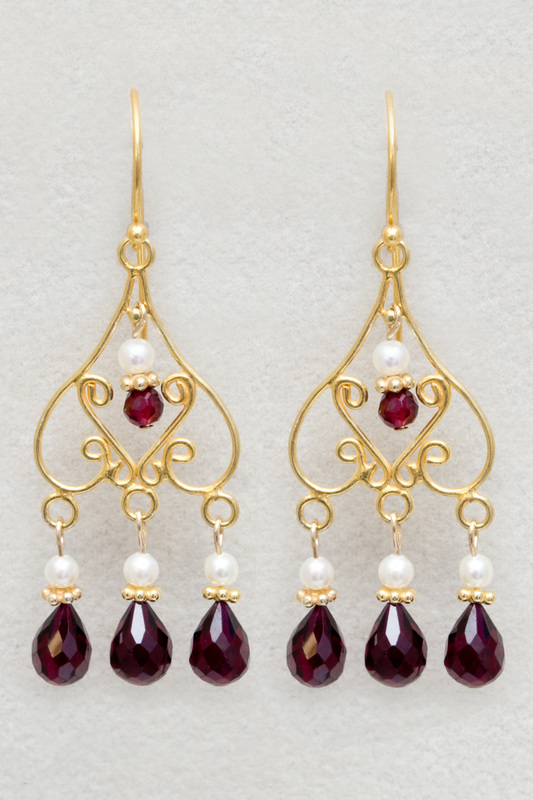 Faceted garnet teardrops and freshwater pearls dangle from vermeil chandeliers. 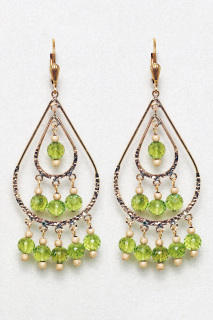 Vermeil French hook Bali earwires. 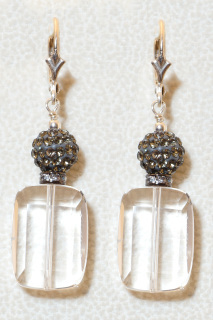 2” in length. 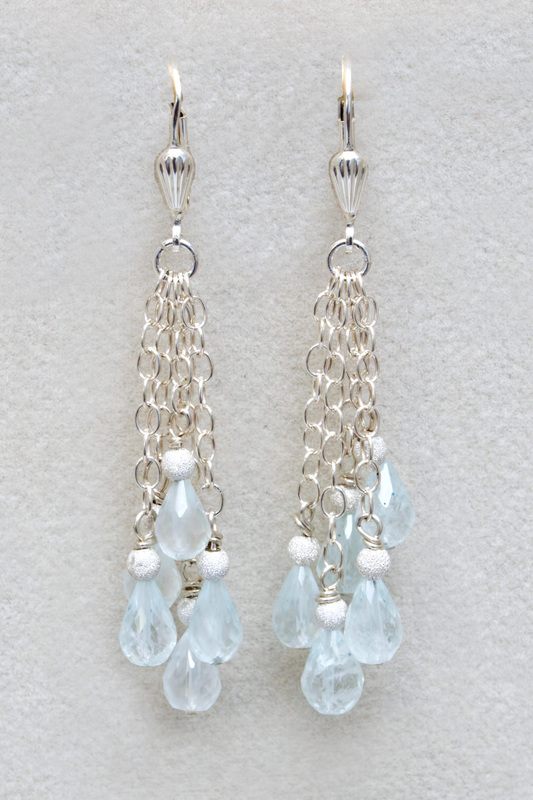 Four faceted aquamarine teardrops dangle from sterling silver cable chains. 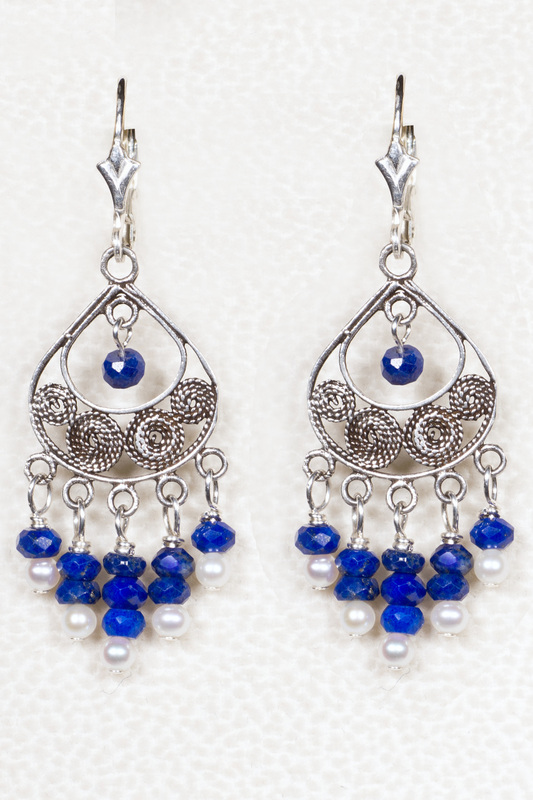 Sterling silver stardust beads accent the design. 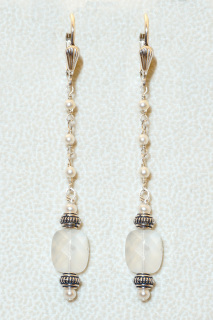 Silver shell leverback earwires. 2.25” in length. 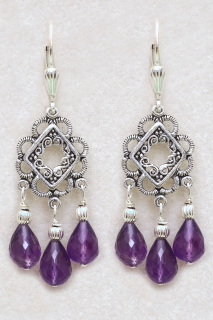 Faceted amethyst teardrops dangle from oxidized sterling silver filigree chandeliers. 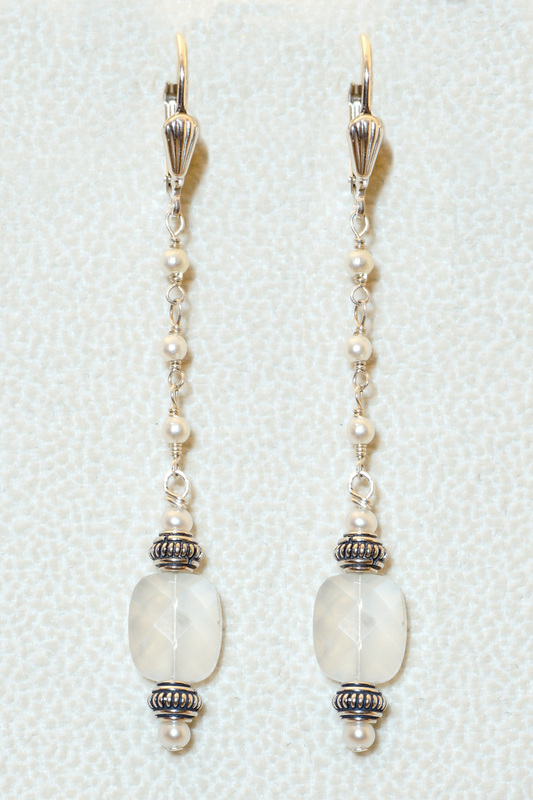 Sterling silver leverback earwires. 1.875" in length. 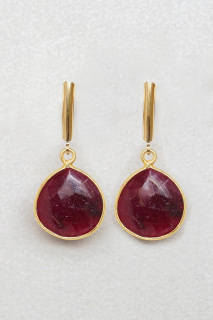 Faceted natural ruby teardrops are accented with a gold-filled stardust bead. 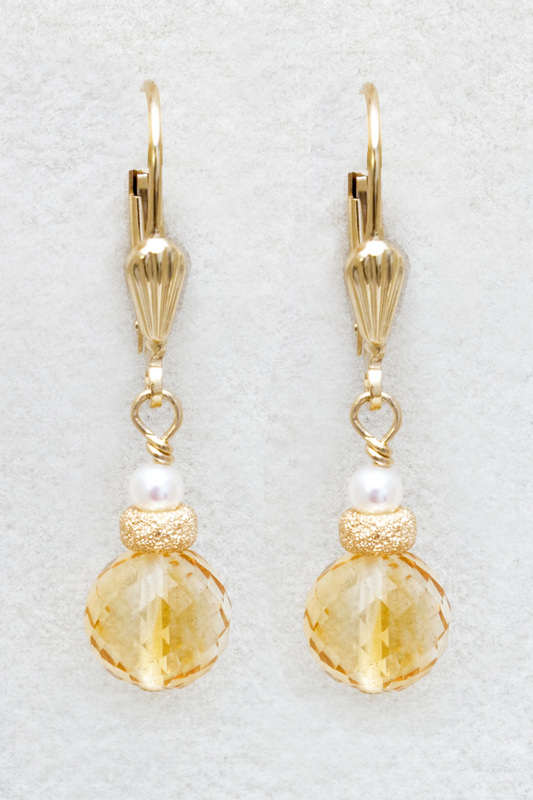 14kt gold-filled shell leverback earwires. 1.125” in length. Three faceted natural ruby teardrops dangle from 14kt gold-filled cable chains. 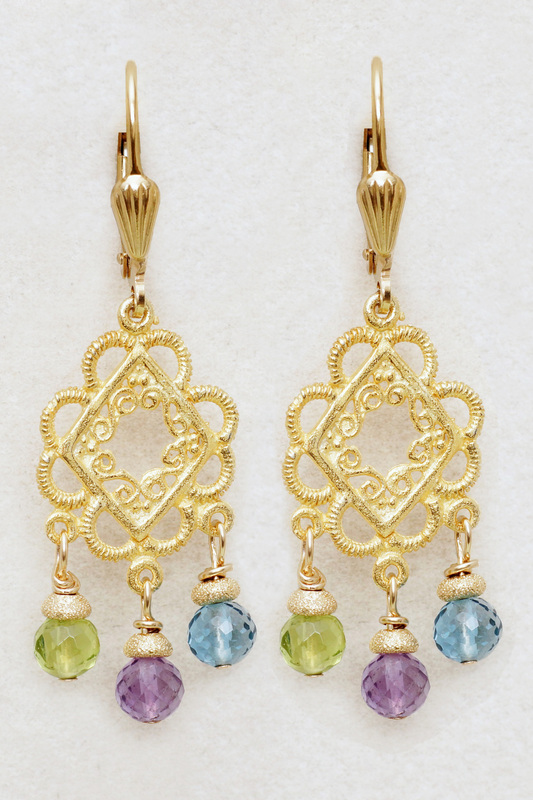 Gold stardust beads add to the design. 2.5” in length. 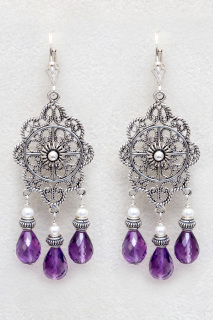 Sterling silver filigree chandeliers are paired with faceted amethyst teardrops, freshwater pearls and sterling silver Bali beads. 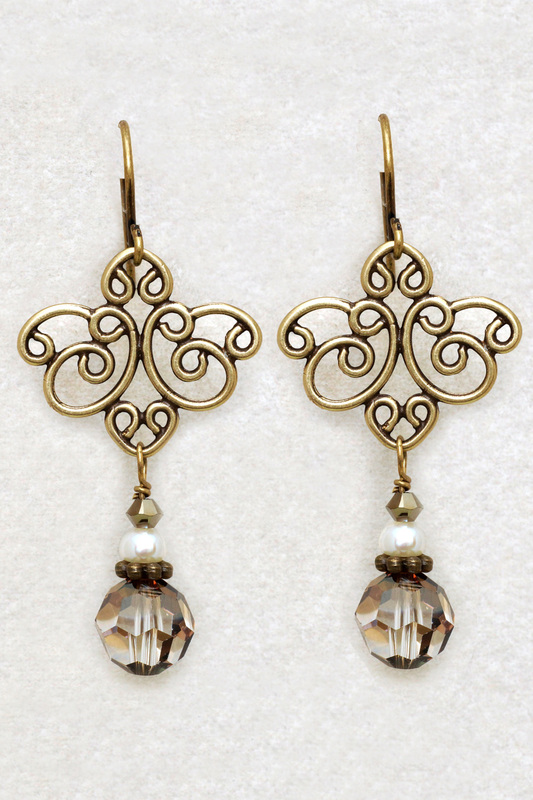 Sterling silver fleur-de-lis leverback earwires. 2.625” in length. 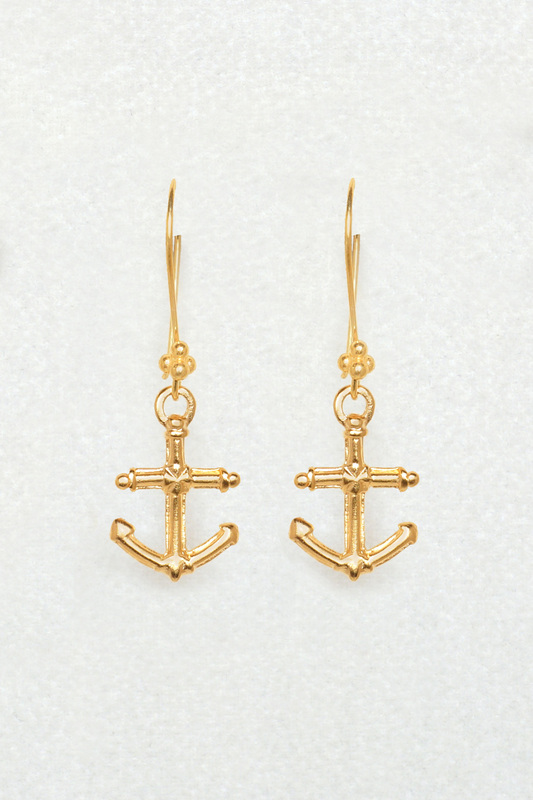 These 24kt vermeil anchors dangle from hand-made vermeil earwires. 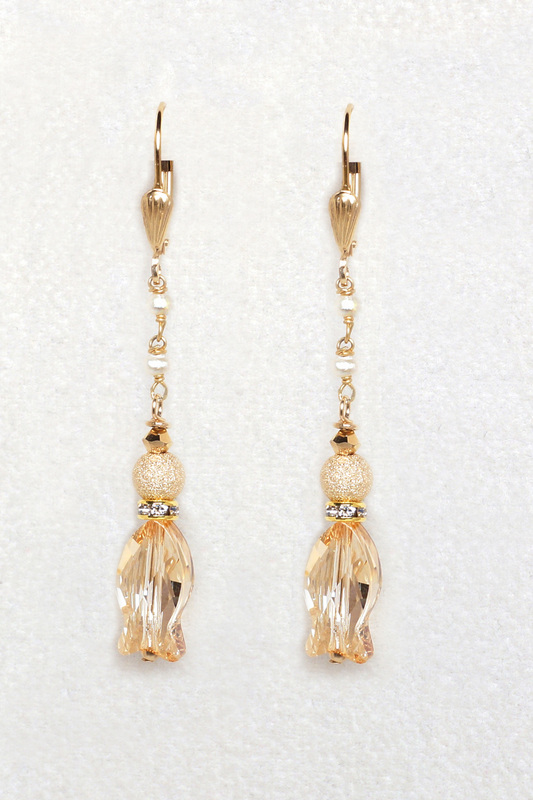 A stream of dangly gold-plated shells is finished with a faceted gold Swarovski crystal. 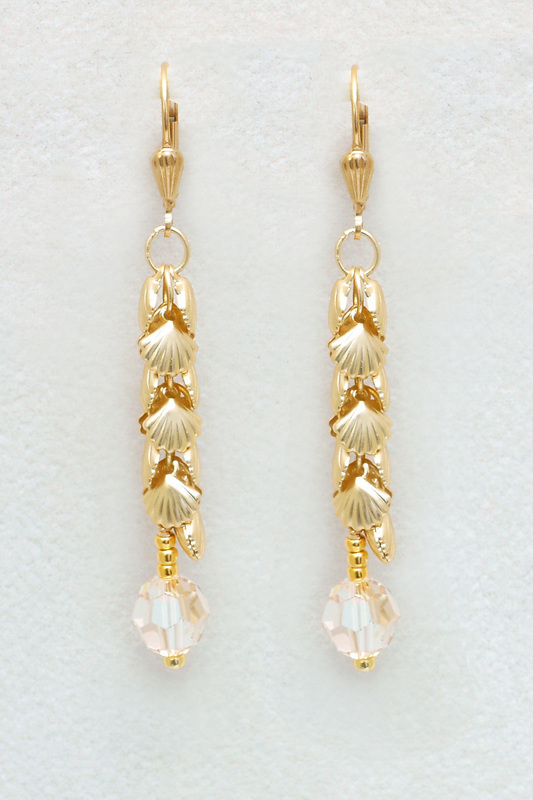 14kt gold-filled shell leverback earwires. 2.25"